It may only have just the first week of the 2018 season, but it was a memorable one for several players who etched their names as members of the 1,000 club. 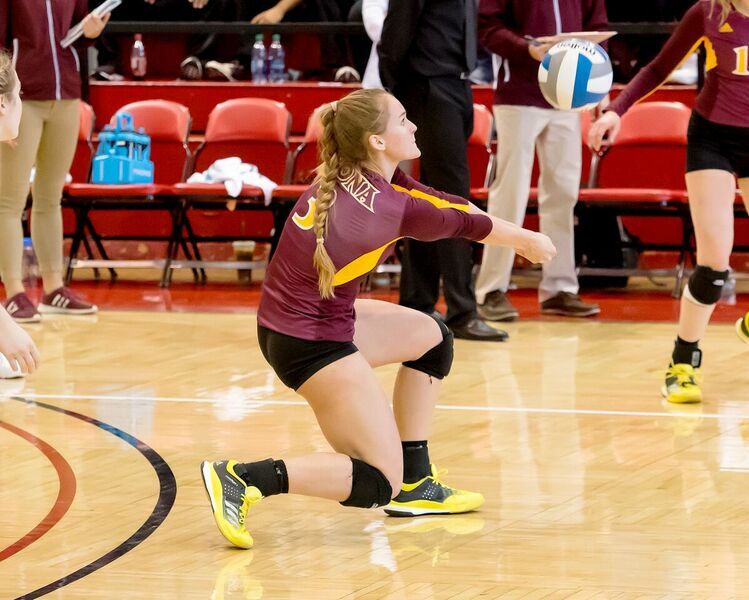 Iona’s Claire Archibald joined an elite group on Friday, moving her career digs tally to 1,007. The senior outside hitter already boasted 1,192 career kills, making her the first member of the 1,000-1,000 Club in 2018. Congratulations to Claire Archibald on reaching a career milestone today! FGCU’s Amanda Carroll is just three digs away from joining the 1,000-1,000 Club. Carroll entered the year with 1,354 kills and 969 digs. She added 31 kills and 28 digs on the weekend to move to 1,385 and 997 respectively. Here’s a look at who else joined the 1,000 kill or 1,000 dig clubs and how they got there. Kentucky’s Leah Edmond was the first to reach the 1,000 kill plateau in 2018. Needing just 11 putdowns coming into the weekend, the junior reached the milestone as the Wildcats faced off with No. 18 Creighton on Friday morning. Elon’s Kam Terry notched her 1,000th kill in the first set of the Phoenix’s Match 2 victory over Charlotte. She notched 10 kills in the opener vs. Presbyterian and joined the club with 11 more vs. Charlotte. Stanford‘s Kathryn Plummer took just 70 matches to reach the 1,000-kill milestone. After posting 13 kills in the team’s opening win over American on Sunday, the junior needed just one in Monday night’s match vs. Howard. She came through with eight in a sweep. College of Charleston’s Kennedy Madison needed 47 kills to reach the milestone and came through with 48 putaways: 19 vs Missouri State, 14 vs. Western Kentucky and 15 vs. Alabama at the Hampton Inn Charleston/West Ashley Classic. UC Santa Barbara’s Lindsey Ruddins had the farthest to go among the new members of the 1,000 kill club, needing 56 kills to reach 1,000. The junior posted 60 putdowns on the weekend at the Miami Tournament, including 12 vs. Saint Louis to move to 1,004. Cincinnati’s Carly Nolan led the Bearcats with 18 digs in the team’s opening match with UC Santa Barbara, moving her to 1,003. She wrapped UC’s stay in Oxford, Ohio with 24 more saves to boost her total to 1,027. Iona’s Claire Archibald racked up 21 digs in Iona’s first two matches of the year, putting her career tally at 1,007. The senior outside ended the weekend at 1,020. Two players reached the 1,000-dig plateau at the Iowa State Challenge on Friday as Ole Miss’ Caroline Adams did so against Virginia and Iowa State’s Hali Hillegas did so against Ole Miss that evening. Valparaiso’s Katherine Carlson posted 17 digs against , 5 vs. St. Francis (Pa.) and then six against Iona to put her name among the ranks of the 1,000 dig club. She tacked on 13 more against Eastern Illinois to up her career tally to 1,026. American’s junior libero Kristen Largay surpassed 1,000 digs during the team’s four-set victory at George Washington on Saturday. With nine more saves on Sunday, Largay moved her career total to 1,015. Rider’s Hailey Riede (993) had to watch everyone else on the court as her team kicks off play on Friday against Lehigh at the Crosstown Tournament in Easton, Pennsylvania. Auburn’s Brenna McIlroy managed 19 kills on opening weekend, leaving her just 5 away heading into the team’s Friday match to open the Butler Invitational. After posting her first 964 kills at West Virginia, Peyton Caffrey transferred to Florida State for her final two seasons. She managed 28 putaways on her opening weekend with the Seminoles, leaving her 8 away from the milestone putdown. FSU plays TCU on Friday at the Colorado State Tournament. New Mexico State’s Tatyana Battle stands at 991 kills heading into Friday’s matches with FGCU and Eastern Kentucky at the Lobo Classic. Fifty-three kills on opening weekend has pulled Creighton’s Taryn Kloth within 10 kills of the 1,000-kill club. She went from 937 to 990 at the Trojan Invitational. Next up for the Bluejays are matches against Arkansas State and North Carolina State on Friday at the SMU Doubletree Classic in Dallas. Wofford’s Catie Cronister piled up 26 kills on opening weekend at the Purdue Reamer Club Premier. The junior needs just 11 more terminations. Seton Hall’s Abby Thelen upped her career tally to 988 with 46 on opening weekend at the Blue & White Classic. The senior outside hitter needs 12 more and should reach the milestone at home at the Seton Hall Classic, where the Pirates host VCU, Pittsburgh and Oklahoma. Arizona’s Kendra Dahlke registered 67 kills on the Wildcats’ opening weekend in Sacramento, leaving her just 12 away as the team prepares to host the Cactus Classic. Friday matches against Lipscomb and San Diego State are next on the slate. Nineteen kills stand between San Diego State’s Deja Harris and the 1,000-kill milestone. She started the year at 930 and added 51 at the Aztec Invitational. The Cactus Classic in Tucson, Arizona, is the next stop for SDSU with Pacific, Arizona and Lipscomb ahead. Veronica ‘Roni’ Jones Perry is 22 away from joining the 1,000 kill club as BYU heads into its home Nike Invitational against West Virginia, Stanford and Wichita State this weekend. Incarnate Word’s Autumn Lockley needs 29 kills after starting the year at 934 and adding 37 at the I-10 Challenge in New Orleans. Next up, UIW faces James Madison, UTSA and Texas State at the Creeds & Crests Classic in San Marcos, Texas. Taylor Leath notched 31 kills in her first weekend at new home Penn State, bumping her career tally to 959. She’ll look to get 41 more as the Nittany Lions play host to Temple and Texas A&M this weekend or next weekend against Stanford and Oregon in Palo Alto. Utah State’s Tasia Taylor is just one dig away from 1,000 after notching 69 saves at the Sacramento State tournament (24 at Sacramento State , 22 vs Arizona, 23 vs. CSUN). Chattanooga’s Miranda Elpers registered 27 digs at the Tennessee Classic on opening weekend, moving to 974. She will look to get the next 26 saves at the Mocs’ home Chattanooga Classic this weekend against UNC Asheville, Tennessee State and North Alabama. Junior libero Ginny Gerig did not play in the team’s opening three matches at the UMKC Kangaroo Classic, leaving her with 966 saves heading into Week 2 at the MT Blue Raider Bash. The team faces Middle Tennessee, Stetson and Troy.